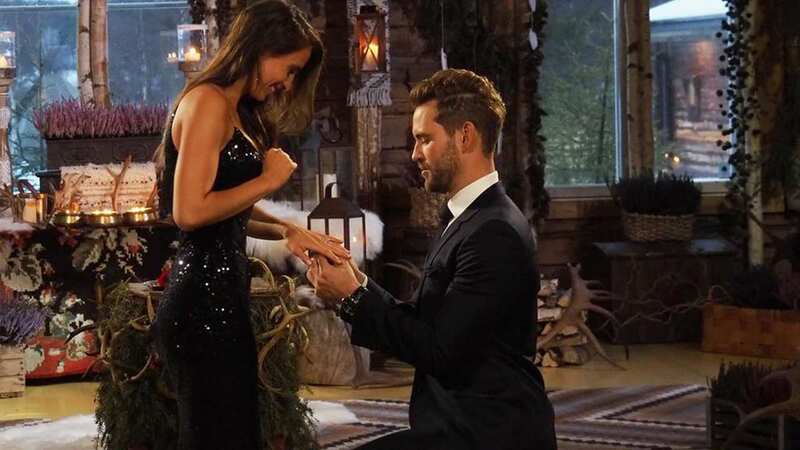 NEW YORK -- Nick Viall and Vanessa Grimaldi of "The Bachelor" are officially engaged! The happy couple took some time out of their busy schedule to talk about what is next for them now that they can be seen in public together. First, let's talk about the ring. It is 3.75 carats in total weight and designed by Neil Lane. How amazing is that?! The center stone is a round brilliant cut surrounded by diamond baguettes and 164 small round brilliant diamonds. Next, Nick, 36, and Vanessa, 29, said that there is no wedding date set yet and they don't know exactly how long they would like to be engaged before getting married. Nick said they are "being realistic," but looking forward to doing normal things together like walking in public and going grocery shopping. Right now, and for the foreseeable future, the couple plans to make their home in Los Angeles. Nick is competing on the upcoming season of "Dancing with the Stars" and he added that they will continue to live in LA afterward saying, "It's where we will call home." As far as any future TV ventures after "DWTS" like "Happily Ever After" on Freeform, Vanessa said that they hadn't thought that far ahead, and they are happy with what they have going on right now. When Nick was pressed a bit for an answer he said, "Never say never!" Viewers might be wondering how the couple ended up engaged, especially since Vanessa had said that she needed a lot of questions answered. She said that her questions were answered by Nick that last night they had together and that she knew she could say "yes" if he were to ask her to marry him. Despite not being able to venture out in the public eye before the finale of the show, Nick revealed that they did get a fun weekend away together in a Toronto hotel. He said that is the only trip to Canada they have had together since the show wrapped filming, but they hope to get back to Montreal very soon to visit Vanessa's family. Nick also revealed that he has started a new company with a few other investors called "The Polished Gent." It's a men's grooming company. He said that it hasn't launched yet, but to be on the lookout for it soon!